It’s time for holiday parties! 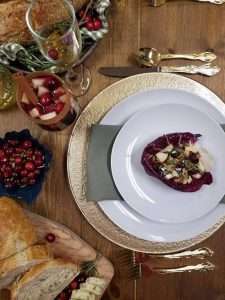 Although this is a joyous time of the year, hosting a holiday party can be stressful. Here’s a few tips and hints on how to reduce stress and throw a party that everyone will remember! Rent, don’t buy. Renting is not only the greener opinion but also the less stress option. When you rent china and linens, we take care of the cleaning for you! No more laundry or scrubbing pots and pans! Drink up! 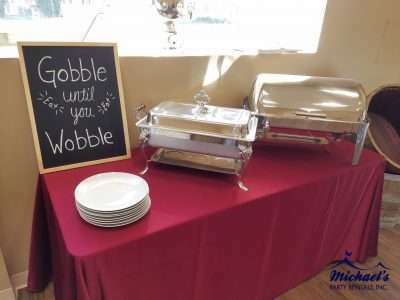 Whether you hire a bartender or create a self serve station, make sure you have plenty of alcoholic and nonalcoholic beverages for your guests. A good rule of thumb is to have a red, white and sparkling wine, 2-3 beer options and a signature drink. 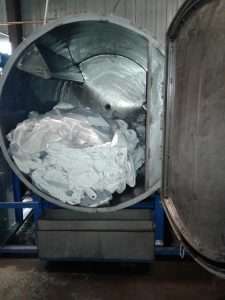 How can we help with this? We have a wide variety of glassware for all of your beverage options. We also have large marine coolers to store water, sodas, beer and wines. 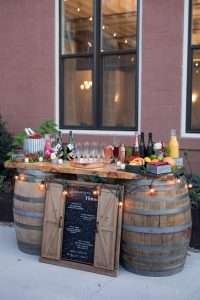 Our plank bars are perfect for a self serve signature cocktail station but we do offer tons of banquet tables or create an actual bar. Dress up your tables. 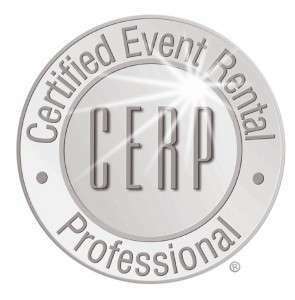 Specialty linens will dress sup your event! With our endless colors and fabrics, we have something for every theme from the classic red and green to a metallic winter wonderland! A place to relax. It doesn’t matter if you’re hosting a cocktail party or a formal seating, chairs are a must! Our chiavari chairs come in a variety of colors and add the perfect amount of elegance to any party. They are also available in bar stools for a cocktail style party. If our chiavari chairs are too formal for you, we do offer a wide selection of folding chairs. Beat the winter weather! Winter means over size jackets. If you are expecting a large crowd, you’ll need some where for everyone to place their jackets. That’s where we come in! Our coat racks come with 50 hangars and have wheel for portability. If you are expecting a lot of guests, you may be worried about space. Take advantage of your patio by renting patio heaters to keep mingling guests warm! And remember, it’s never to early to start planning! Give us a call today to get your order booked! 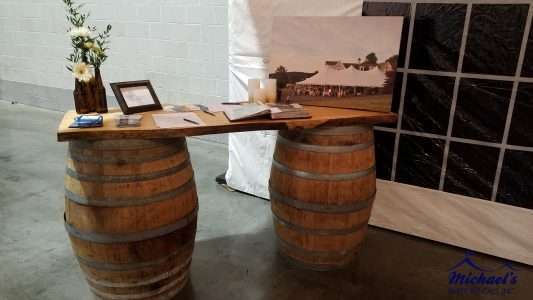 Whether you’re having a dessert bar or a signature drink bar, our wine barrel plank bar is the perfect addition to your next party! Take a look for yourself! 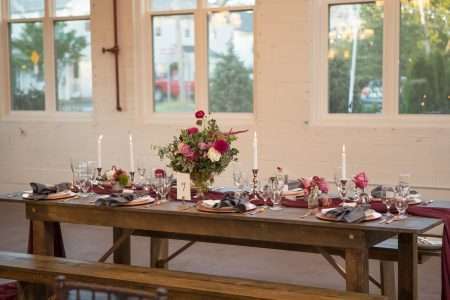 Bring more to the table at your next event with our farm tables. Our farm tables are too pretty to be covered with a tablecloth. New venue alert!! 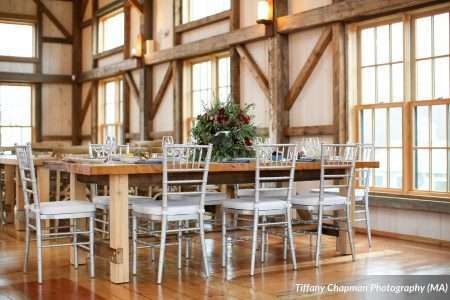 Valley View in Haddenville, MA is the perfect setting for your wedding! Need some evidence? Here’s some shots from a stylized photo shoot put together by Jackie from Events by Jackie M! 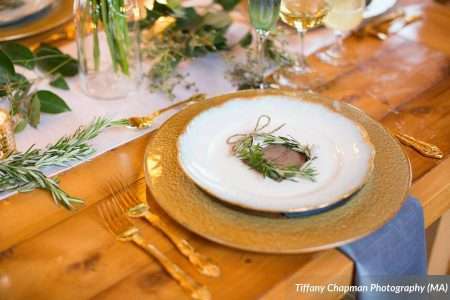 Although thy own their own farm tables, our silver chaiavri chairs, gold flatware, charger plates, and glassware look stunning in this venue! Thank you Tiffany Chapman for the beautiful photos! Damaging Winds: The tent could collapse and injure occupants; the tent cannot protect occupants from flying debris. Fire or Explosion: The tent cannot protect occupants from excessive heat, flames, or flying debris. Excessive weight could cause the tent to collapse and injure occupants. Excessive Rainfall: Saturation of ground with water may compromise securement. The tent could collapse and injure occupants. Flash Flooding: Saturation of ground with water may compromise securement. The tent could collapse and injure occupants. 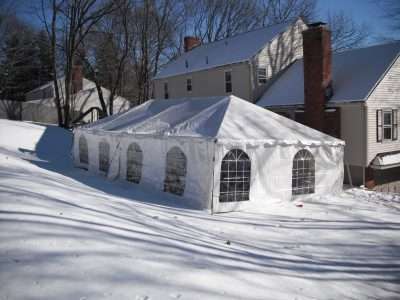 Snow Accumulation: Excessive weight could cause the tent to collapse and injure occupants. Atmospheric conditions may not be suitable for occupants. Earth Movement e.g., tremor, landslide: Ground conditions may not be suitable for occupants and may compromise the tent’s securement. For a public event: a show manager, representative of the venue, the fire chief, etc. The point person should establish an evacuation location. The location should be a permanent building large enough to accommodate your guests. 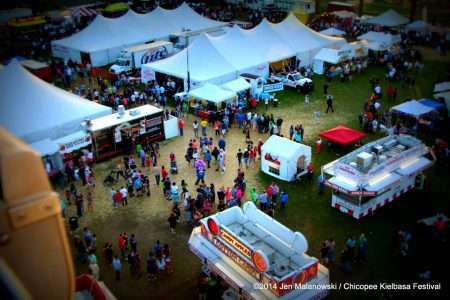 Coordinate in advance to ensure it will be open and accessible during your event, and make a note of its address in case you have to call for emergency assistance. Of utmost importance, the tent should never be used as a shelter in an emergency situation. 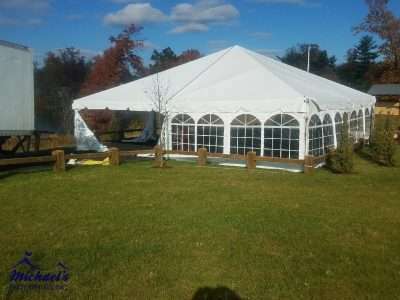 Here at Michael’s Party Rentals we take pride in clean tents. 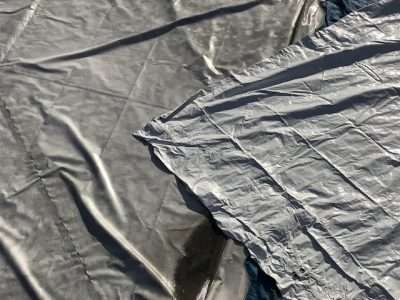 Our state of the art Teeco tent washing machin is specially designed for washing vinyl, with a carefully controlled water temperature setting to efficiently clean your tents. 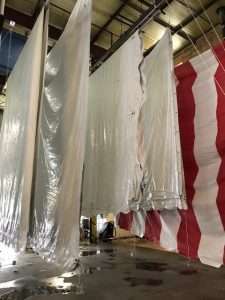 We can even make the dirtiest of tents look pristine again! If you’re having a large dinner crowd for Thanksgiving, you may need some help to keep all the food hot! We have just what you need if that’s the case. Our chafing dishes make keeping your food hot and easily accessible! It may be November, but our crew is still out there installing tents! Here’s a 40×40 Navi Trac Tent set up at the new Sullivan park in Sprignfield! We also supplied heaters for this tent and patio heaters for the adjacent pavilion. I wanted to thank you for the fantastic golden chairs for the Rios/ Serrano wedding. They really added that touch of glamour to the entire design. I am so glad I found you guys! You will definitely be hearing from me soon!